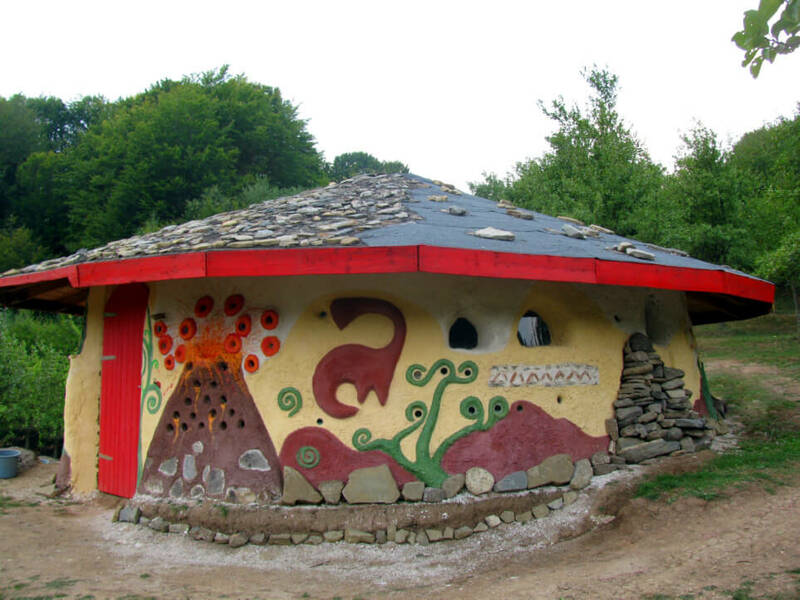 The House of Volcanoes is a place for visits and educational activities created and managed by Drag de Hateg (Love for Hateg) Association, in partnership with Hateg Country UNESCO Global Geopark, with the help of the Volunteers for the Geopark and of the Densus community. Here you can actively learn, experiment and explore the Story of Earth. 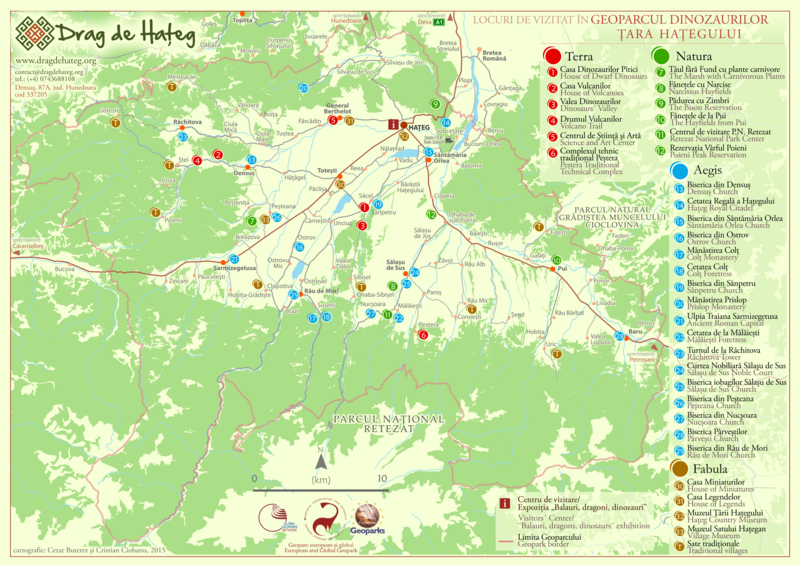 The House of Volcanoes is part of the Hateg Country UNESCO Global Geopark’s network of visiting and educational points. The story of the ancient volcanoes of Hateg Island is as beautiful and mysterious as the story of dinosaurs. When you arrive at the House of Volcanoes you will discover a fascinating world. You will learn about the Earth’s formation, the volcanic eruptions, the traces of a lost ocean, dinosaur fossils, old and new plants and, last but not least, you will experience the dialogue with nature. The visits and educational programs are made only by reservation. 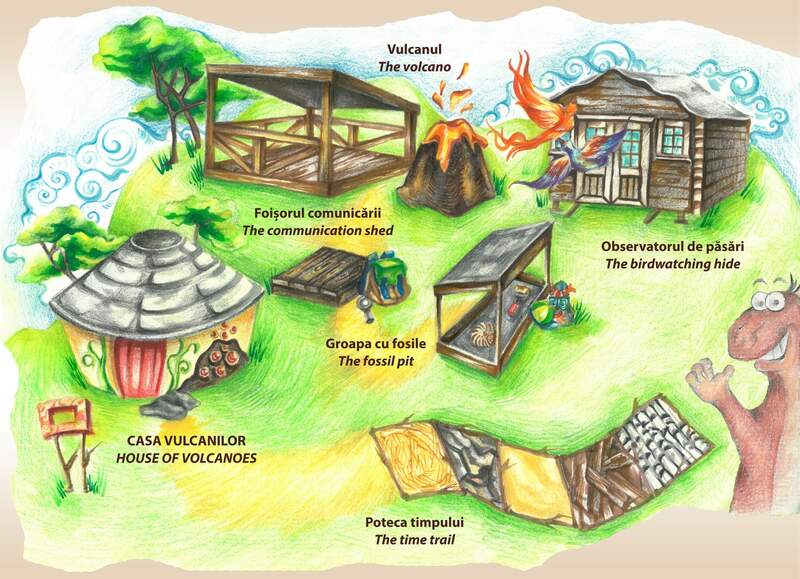 What is the House of Volcanoes? The House of Volcanoes is a construction made of earth, which tells the story of Earth, particularly the geological story of the Hateg Region. It is a place where you can encounter the volcanoes which dominated Hateg Island 70 million years ago. The construction is made of cob (clay, sand, straws and water). 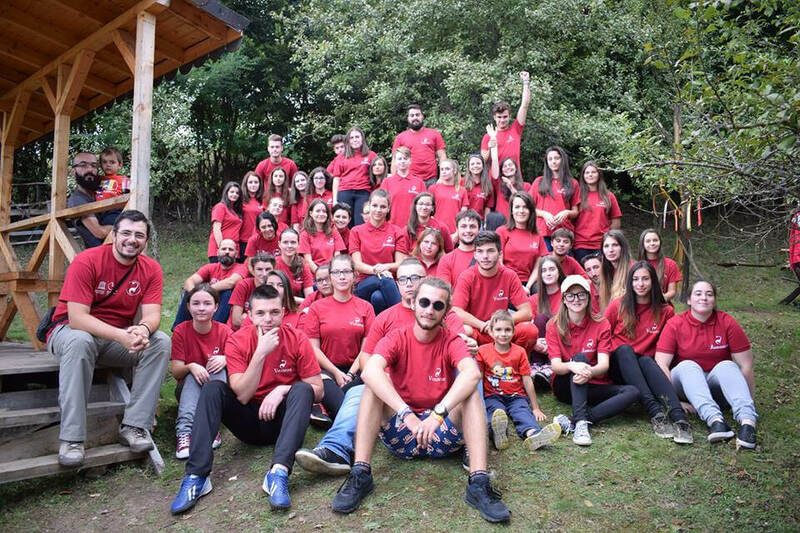 It is a space for visiting and for non-formal educational programs created through the work of volunteers since 2014 through a series of grants offered by the Foundation for Partnership and MOL Romania. Partners: Densus School, Satul de Lut Association, Pro Edu Densusianu Association, Densus local administration, SENS Association, DRZ Studio Deva, Geo-Team, Center for Development Resources 2020, Rachitova School, Hunedoara County Environmental Agency, Corvinias Association, Pixel Viu Association, Center for Local Action Resources, Turism Retezat Association, Romanian Ecotourism Association, Tara Hategului – Retezat Ecodestination, Retezat National Park, Gradistea Muncelului – Cioclovina Natural Park, ProPark and the Romanian Science Center. - 300 volunteers directly involved, 200 work days, 20 m3 of clay, 15 m3 of sand, 5000 litres of water, 30 m3 of cob mixed with bare feet. 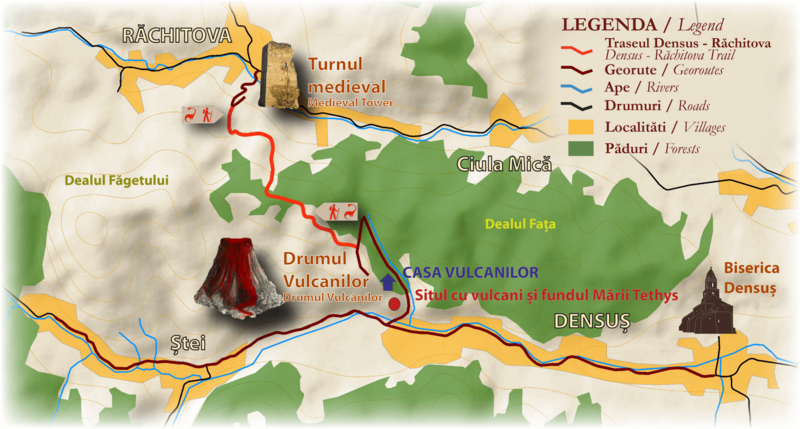 - New scientific discoveries about the volcanoes from Densus made by the Romanian Academy Geodynamics Institute. - more than 500 media articles, winner of the popular vote for the best volunteering project in Romania 2014, "CarpatCement" award for the best educational project in Hunedoara County 2014, “Natural Protected Areas” award 2014, qualified in the best 5 final for the best youth project in Romania 2014. The House of Volcanoes is part of a UNESCO designated territory and of a ecotourism destination. How to get to the House of Volcanoes? The House of Volcanoes is located 17 km from Hateg town and 3 km, 300m from the road. Last April Sunday – Geopark Challenge. Half marathon of the Hateg Region fortresses. Half marathon, relay and cros national competitions, on the route between two Hateg fortresses. Every year the route is different, it connects and promots other local historical sites. EGN Week gathers a series of events from all the European Geoparks. In a traditional Romanian day of "sanziene" we celebrate the Geopark and the traditional Romanian blouse - IA. The events are guided tours, exhibitions, workshops and educational programs, during which the participants are asked to war an IA. It's the most important cultural event of the Geopark. During three days, it gathers activities meant to promote education, culture and the local values. The event explains the importance of volcanoes and their role in Earth's evolution. On 24 August, year 79 BC, Vesuvius erupted destroying the ancient cities of Pompeii and Herculaneum, but preserving under the ash the day to day life of an ancient world. Re-enactment festival in the Roman ancient province capital of Sarmizegetusa. Andi Andezit travels the world! He is our mascot who travels the whole wide world to make new friends and to find fascinating places Do you want to see where he is now? Our local guides are ready to give you detailed information and help you plan your stay in Hateg Region. This website was created in the project “Promoting the protected areas in Hateg Region through games” implemented by Drag de Hateg Association and financed by MOL Romania and the Foundation for Partnership through the program Green Spaces 2018. This material reflects exclusively the opinions of the authors. The financing organisations are not responsible for the information on this website. Do you want to receive news about the House of Volcanoes? The House of Volcanoes is situated 3 km from the church, on the road to Stei village and it’s signalled with panels. House of Volcanoes © 2017. All rights are reserved!